An unusual case of dysphagia? A 16 year-old girl was referred to our paediatric department due to intermittent dysphagia during six months. Occasionally, she needed to induce vomit to dispose of stuck food. She reported no odynophagia, no gastroesophageal reflux symptoms, no abdominal or retrosternal pain, and no changes to defecation patterns. The patient was otherwise healthy and average weight with no weight loss. She had no previous medical record, except acne vulgaris, treated with tetracycline 250 mg daily for three years. She lived with her parents and attended high school, and no psychosocial difficulties were reported. The patient had an unremarkable physical examination and was mentally age-appropriate. Blood tests revealed iron deficiency anaemia: haemoglobin 9.3 g/dL (reference range: 11.3-15.8 g/dL), ferritin 3 ng/mL (5-92 ng/mL) and mean cell volume 73 fL (82-98 fL). Leucocytes, thrombocytes, folic acid, cobalamin, sodium, potassium, ionic calcium, magnesium, creatinine, albumin, transglutaminase, gliadin peptide-antibodies and c-reactive protein were all within reference ranges. Rapid streptococcal test was negative and an allergy screening was performed with no findings. 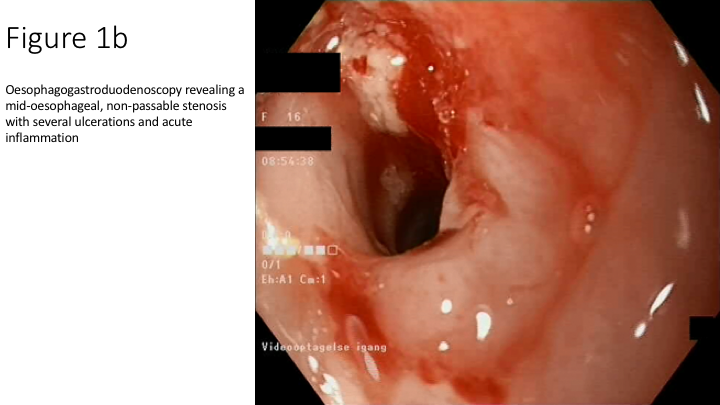 Eventually, an oesophagogastroduodenoscopy was performed, which revealed a mid-oesophageal, non-passable stenosis with several ulcerations and acute inflammation (Figure 1). 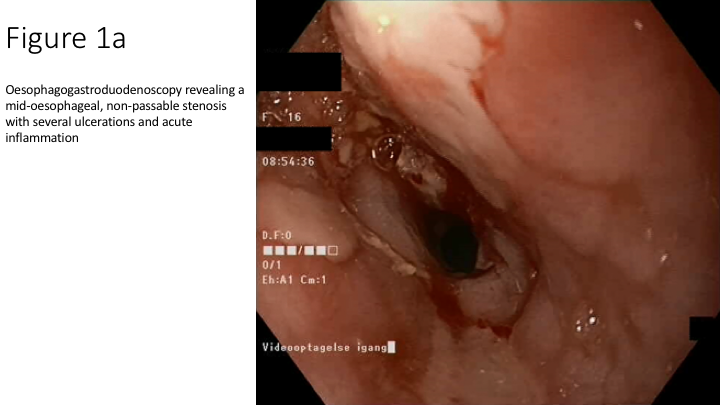 Question: What is the likely diagnosis and what is the treatment? Polyp detection rate: does length matter?